The devastating sell-off in the stock market on April 15 is, so far, net-neutral on returns on equity for the year. The S&P 500 index is up 11% in 2013, as measured by the SPDR S&P 500 ETF, while the Dow Jones is up 13.5%. A recovery in the index a day after the sell-off does not imply gains will hold. If investors look more closely at the volume for the SPDR Dow Jones ETF, trading volume was around half as high as the previous down-day. 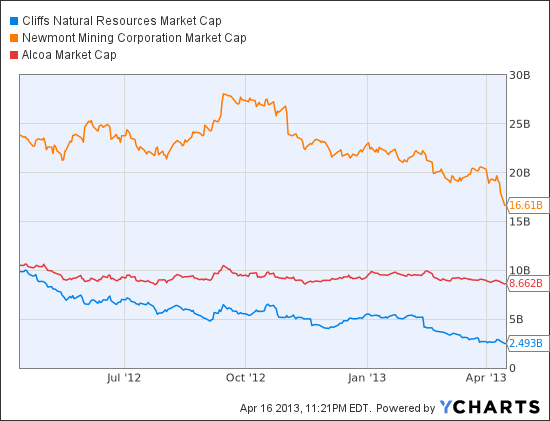 Cliffs Natural Resources Inc (NYSE:CLF) is the worst-performing S&P 500 company for 2013. Investors are continuing to unload their positions in the company after management reported weak quarterly results. Concern is high that the company is unable to manage its cost base for iron ore. If iron ore prices are on a chronic decline, Cliffs investors could expect more downside. Cliffs has a market cap below $3 billion, and debt around $4 billion. If the share price keeps dropping, a bigger company like Rio Tinto plc (ADR) (NYSE:RIO) may offer a significant premium to shareholders. Cliffs Natural Resources Inc (NYSE:CLF) is trading at 70% below the $29.81 target price. In the gold sector, Newmont Mining Corp (NYSE:NEM) fell, along with other gold miners. The company is now valued at a P/E of 8.96. The share price of Newmont is 51% below the $51.06 consensus target price. Investors waiting for a rebound in gold stocks will be paid a dividend of $1.70, which yields 5.03%. Despite the limited value of technical analysis, the bearishness in Newmont is significant. Volume was far higher than the average, as shares plunged from $40 to a recent $33.78 closing price. There’s no way investors can identify a “bottom” until after the fact. Eventually, Newmont Mining Corp (NYSE:NEM) will reach that level and could offer up to 51% upside, if analysts are right. Another basic materials company is Alcoa Inc (NYSE:AA), which relies on economic activity to grow sales. Like Cliffs Natural Resources Inc (NYSE:CLF) for iron ore, Alcoa will suffer if aluminum demand weakens. It’s easy for investors to anticipate weakening demand; weak sales from automakers will imply weak demand for aluminum sheets. Alcoa shares could return 22% if analysts are right. The company issued a positive sales forecast for the metal sheet, and expects sales to more than triple by 2015. Even if auto sales are flat, the increasing use of the metal is a trend for Alcoa Inc (NYSE:AA).